Most of late 2013 and 2014 was dedicated to helping my parents, both of whom were failing. A great deal of time was spent in Portland, Oregon reflecting on their circumstances and our family’s history. Music began flowing like water and I needed to record these ideas but what form would they take? I was also unsure about making this another Val Gardena album. Jeff, my long time music partner, was extremely busy and bringing him into such a personal project seemed inappropriate. After 40 years of writing music I took the plunge and made my first solo album. Bob Stark was a perfect partner, providing emotional and musical support, compositional ideas and the grounded environment that proved perfectly suited to the material. 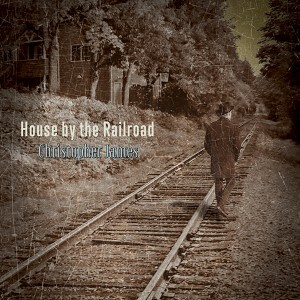 House by the Railroad is an autobiographical journey but it is ultimately about life, love and hope. In 1950, my mother left Salem, Massachusetts at the invitation of my father, optimistic about a new life in Portland, Oregon. Eight years later I was born in a house by the railroad. Thinking back to what she might have felt on that long train journey west, I wanted the music to capture motion, anxiety, and hope. The high desert of Oregon is where I am most at home, deep in my soul. It’s remote and beautiful, and l love it there. Tom Waits is one of America’s great poets and songwriters. His songs often capture an Edward Hopper-like feeling of loneliness and isolation. This instrumental interpretation of one of his great songs fits perfectly with the mood of this album. Highway 97 from the Columbia River Gorge to Central Oregon is one of the most under-appreciated scenic landscapes in the world. Timeless, hypnotic, and beautiful beyond words. I love Burt Bacharach’s music, and this song combines an Astrud Gilberto-type vocal with a BB inspired tune. As my father was dying, he happened to have a lucid period when he spoke for hours about various things. He kept talking and talking about heaven and being on the other side. When I was young, my father always wore this peculiar hat when he was outside. I can still see him in it – remote and a bit odd, but always resolute. At peace with light shining through the stained glass windows. Someone once said to me that being from Oregon was like being from nowhere. I’m proud of my roots, but it was my destiny to leave. A moody piano vignette set in a lonely black and white bar. Back in the day it seemed every album had one of those “black sheep” songs that didn’t fit with everything else. This is mine! Songwriters know those moments when the music seems to write itself. This was one of those moments for me. I was thinking of my mother, who was close to passing when I sat down at the piano. An hour later, my sister called to say she had slipped into a coma, and I flew out immediately to be with her. I made it just in time to say goodbye.